Guaranteed “Barbie Girl” will be stuck in your head after reading this post title. I swear I’ve been singing it since Saturday. 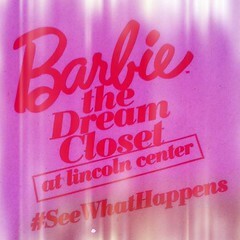 I swear being at this Barbie Dream Closet Event this weekend was probably the coolest thing ever and I’m 24. I could only imagine what the experience would have been like if I was 8. 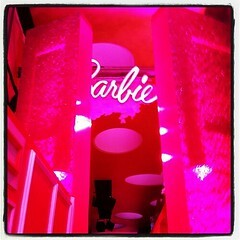 Real Life Barbies…dream come true!! 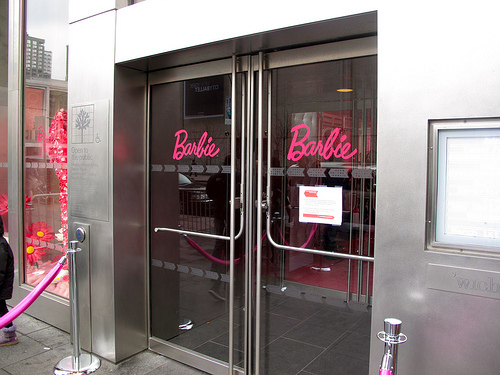 & who doesn’t like a goodie bag…and believe me Barbie didn’t disappoint. The “Adult” bags contained Limited Edition “Shoe Obsession” Barbies & a shoe bag for Barbie’s shoes & one of our shoes!!! Seriously was this gift made specifically for me?!? 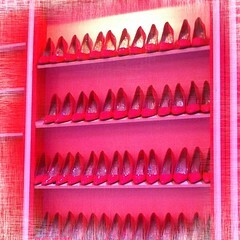 & of course I just happened to own a pair of hot pink pointy toe pumps…very Barbie! My cousin, Tiffany, just finished recording the music for the new Barbie movie, “The Princess & The Popstar”. And let me tell you its awesome!! You might remember me saying I was in LA back in October, well thats why I was out there! Check out her awesome pics from the event on her FB page. & be on the lookout for the movie & the Barbie in her likeness with her voice! So happy for her! Every girl’s dream come true! Omg how exciting would this be!!!! this looks like so much fuuuuuuuuun!!! I am obsessed haha! I love it….too cute I want to go and go pink shopping…YAY too adorable.